A gift shape in the shape of an egg! Yes, thats the craft you make for Easter, and gift it to your near and dear ones. Scroll down to see how. This Easter egg is made of gum paste. It is easier to make. And it may be filled with home-made sweets, chocolates and candies. You can also use it as a container for a small gift, such as a folded and wrapped tie, or a brooch. a child-safe scalpel or knife Color the gum paste as required. Then roll it out and smooth it into a well-polished smooth Easter egg mold. Work the paste into the mold slowly. Use the knife or scalpel to trim the uneven edge level. Make two and leave to dry overnight. Join the two halves with small blobs of royal icing and allow to set. Trim the join carefully. Alternatively a long fine braid of the paste may be made and used to cover the join. Mold the soft braid around the egg, sticking it in place with an occasional blob of icing. Make a neat join at the bottom of the egg. 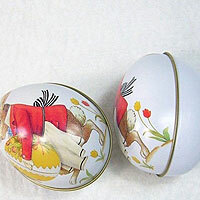 The egg may be glazed with confectioners varnish to give it a hard shiny finish. * You can find egg molds at any standard kitchen supplier, craft store or a party supplier.